As we prepare to welcome 2019, we’re pausing to reflect on the amazing positive impact RideAmigos partners have made on mobility, traffic, commuter wellness, and our planet. We’re proud to be working with the leaders from Fortune 500 businesses, top research universities, and innovative government agencies engaging commuters to make a healthier, happier planet. RideAmigos users avoided millions of single occupancy vehicle trips in 2018. Organizations partnering with RideAmigos are saving money, burning more calories, and reducing their greenhouse gas output by thousands of tons. They’re doing it by offering better information and the incentives to make smart choices. Together, we’re changing the way people commute – creating a happier, healthier future for everyone. We at RideAmigos are so grateful for the opportunity to support your success. Thanks for joining in our mission, using our tools, and leading the way for so many others. Thank you for helping us create a better world. We look forward to continuing to empower transportation heroes in 2019 with cutting edge trip planning, ridematching, incentives management and gamification, and to share our collective wealth of knowledge and experience in the RideAmigos Academy. To make RideAmigos part of your own 2019 success story, get started here today! The 2018 ACT TDM Forum is happening on November 13 and 14 in Nashville, Tennessee, and we’ll be watching it closely. The Association for Commuter Transportation (ACT) holds several conferences and events throughout the year in addition to its annual International Conference in the summer. This forum on transportation demand management (TDM) is a key opportunity for anyone working on commuter mobility and transportation in the private or public sector. Just like last year’s event in Las Vegas, this one has an agenda focused on preparing TDM professionals to keep up with the latest changes in technology, policy, and the evolving mobility ecosystem. Starting with the opening keynote from Gary Gaston, CEO of Nashville Civic Design Center, it promises to be an inspiring two days. And like the other events organized by ACT, what happens at the TDM Forum is a great indication of where the industry is heading. An impressive agenda is taking shape and we’re excited about the topics and panelists that are showing up. From new dockless scooters to big data, we’ll be splitting up to make sure we don’t miss any of the breakout sessions featuring leaders in TDM. Kicking off the sessions on Tuesday morning, RideAmigos Director of Customer Success, Corey Tucker, will be moderating an important discussion of how organizations can leverage mobility data to make better operational decisions. We’re also looking forward to hearing from Lucy Tice and Jessica Sanborn from Google talk about what drives commuter choices. While you’re counting down to Nashville, check out this Coffee Talk in which Lucy shared how Google incentivized employees to bike to work. More sessions are still being added, so check out the full agenda here. Each year, the 40 under 40 represent agencies, companies, and academic institutions that are leading change. In 2017, five RideAmigos clients, including Peter Williamson, were among the honorees when awards were presented in Las Vegas. RideAmigos co-founder Jeffrey Chernick is also a past honoree. We always keep an eye on this list of 40 industry trailblazers and the organizations they represent to learn from their success and see what they’ll do next. If you were at the 2018 ACT International Conference in Anaheim, you probably noticed something: IT. IS. GROWING. From innovative mobility providers and technology vendors to an ever-increasing number of organizations prioritizing commuter transportation programs, the new faces at each ACT event are signaling that TDM is starting to take center stage. Whether you have been working to solve commuter mobility challenges for decades or are new to the industry, you should see the growth of this amazing community as a really positive sign. Don’t miss this and other opportunities during the year to hear from and network with industry thought leaders, commuter management professionals from around the world, and new mobility providers. We recently released major updates to the RideAmigos mobile apps and commuter engagement platform. But we have lots more in store. Our team will be on hand in Nashville with some exciting things to show you. If you’re already a RideAmigos customer, you can also get early previews through Academy Office Hours webinar series. 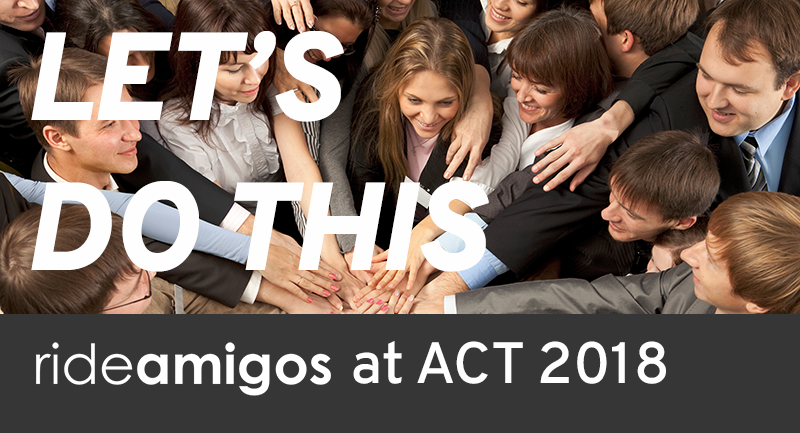 If you’ll be coming to the ACT TDM Forum and you’d like to meet with our team, email act@rideamigos.com. If you can’t make it, you can contact us for a demo and consultation. Either way, we’d love to meet you to learn about your challenges and share some of what we’re excited about this Fall. 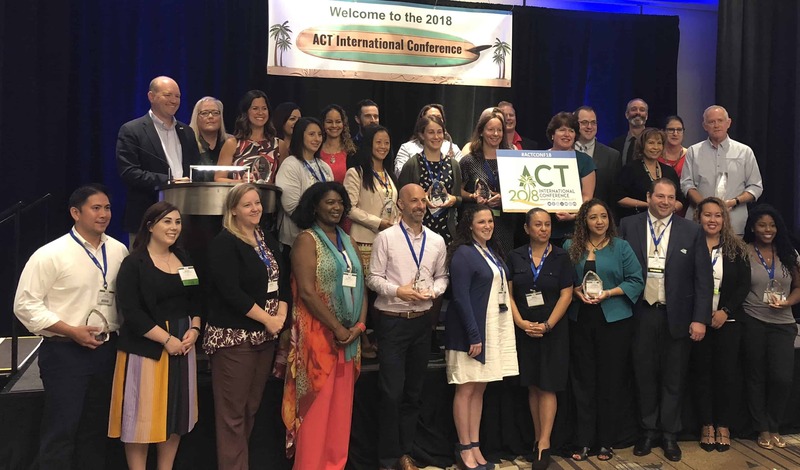 On August 1, the Association for Commuter Transportation (ACT) hosted its 2018 international conference. This year’s gathering was held in Anaheim, California, and during the event, 15 individuals or organizations received awards for their outstanding achievements in transportation demand management (TDM). 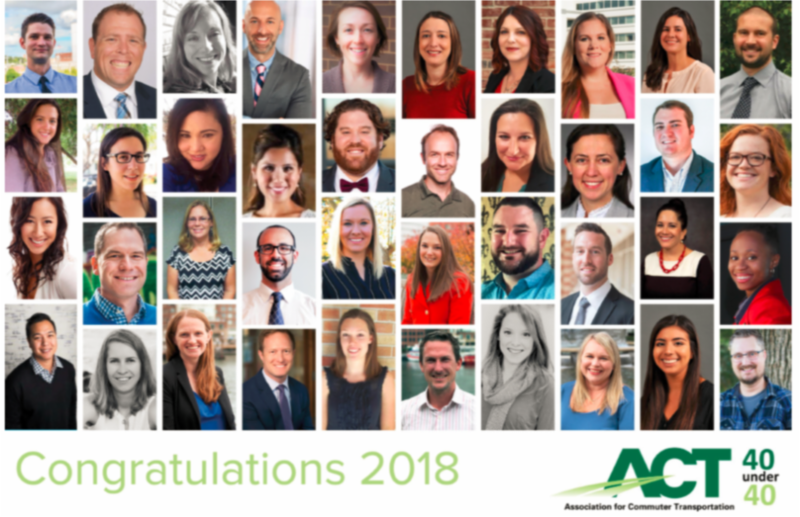 The entire RideAmigos team is excited to announce that eleven of the twenty-nine ACT Award finalists and four of the winners use RideAmigos to power their innovative commuter programs. First, the Parking Services division at California State University-Los Angeles copped a Marketing and Outreach award for its successful efforts to promote alternatives to solo driving, implement forward-thinking commuter projects and policies, and reduce the local environmental impact of commuting. Third, Go Redmond won in the Commuting Options – Biking category. The initiative is a partnership between the Greater Redmond Transportation Management Association (GRTMA), King County Metro, and the City of Redmond, and it aims to increase bicycle ridership year-round as a commuting alternative. Go Redmond also provides a wealth of informational resources to people and organizations looking to reduce their carbon footprint while embracing smarter transportation alternatives. Finally, the University of California-Los Angeles (UCLA) Transportation department captured the Commuting Options – Public Transportation award for its intensive efforts to make public transit, cycling, carpooling, and vanpooling more accessible to its commuter base of 80,000 staff and students. All four of these organizations rely on the revolutionary, tool-rich RideAmigos platform to create, administer, and power their commuter programs. We’d be proud to be a part of your success story in 2019. Get started with RideAmigos today, and improve mobility, sustainability, and organizational health and wellness by putting the power of our cutting-edge software to work for your organization. The Association for Commuter Transportation International Conference is taking place July 29th through August 1st, and RideAmigos is proud to be a sponsor and exhibitor. The best part for us is that so many of our awesome customers will be part of making this year’s event extra-special. As we’ve said time and time again, working for our amazing user community is what makes us love what we do. If you’re not already part of the RideAmigos Academy, check out all the ways you can connect with our customers and our team in Anaheim. You’ll see what we mean! David Sorrell, who manages the TDM program at UC Berkeley, will be on a panel discussing how dockless bike share systems have changed, how we think about and plan for bicycle commuting, and how his program is responding. This panel features Tien-Tien Chan, TDM Program Manager at the City of Austin, along with others behind residential TDM campaigns from around the nation. Together they will discuss how they measured success and share valuable lessons learned. A panel of experts from across industries will focus on the commuter incentives strategies that are driving real, measurable results, including daily incentives, commuter stores, and parking cash-out programs. This panel features three RideAmigos clients; Brittany Barrett, Assistant Director of Transportation at Emory University; Kim Comstock, Commuter Programs Manager at Commute.org, and Tien-Tien Chan, TDM Program Manager at the City of Austin. It will also be moderated by our own Corey Tucker, Director of Programs and Customer Success at RideAmigos. Amy McCrary, Senior Sustainable Transportation Specialist at Stanford Research Park in Palo Alto, California will be part of a panel discussing how to help commuters to rethink how they move to, from and around your facilities. Kim Comstock of Commute.org in San Mateo County will join another panel to discuss how employers can differentiate themselves in recruitment and retention by leveraging commuter benefits and incentives. This panel will share examples of how organizations of different scales implemented successful strategies that fit their budgets and needs. Does this sound familiar: You have a group of people interested in vanpooling but, in practice, it’s difficult to get them all going? In this session, Patty Olmsted, Senior Business Outreach Specialist at the Mid-Ohio Regional Planning Commission, and other experienced panelists will share real-life vanpool group formation tips to overcome the challenges and get more people in vanpools. Shawn Chavira, Associate Director of Transportation, USC Transportation, and other panelists will help us understand what kinds of commuter benefits programs work for large employers to reduce the transportation frustrations of their employees, visitors and surrounding community. Kudos to all these amazing programs, teams, and individuals – you’re all transportation heroes in our book! We love working with and learning from leaders like you who are at the top of their field. Drop by the RideAmigos booth to take part in the RideAmigos ACT Commuter Challenge! We’ll be giving away $50 gift cards for most CO2 saved, most single occupancy vehicle (SOV) miles avoided, and most calories burned. Even if you don’t top the charts, you’ll still have a chance at a random giveaways of our new Transportation Hero t-shirts. If you’re a RideAmigos customer, you should already have your calendars blocked off for Tuesday night’s user meet-up and appreciation dinner. Need more convincing? Here are 5 reason’s not to miss this year’s meet-up. There’s no better way to wrap up another great ACT conference than the annual karaoke party. This year’s party will be bigger and better than ever, just a short walk from the conference hotel in the Anaheim Garden Walk at 8pm on Tuesday, July 31st. We’re also excited to welcome Lime as a co-sponsor of this year’s event. They might even bring some of their famous electric scooters. If you’re not already on the list, sign up for your free ticket now! If you’re looking for a RideAmigos team member to chat with about the latest and greatest updates to our platform, programs, and mobile apps, just drop by booth #27 or send a note to act@rideamigos.com. We’d love to meet you in person and learn about the work you’re working to engage commuters in your area! ACT 2018. Let’s do this! The RideAmigos Academy is a tremendous resource for RideAmigos customers, providing opportunities for learning, sharing, and support. Each year at the Association for Commuter Transportation’s International Conference, RideAmigos customers and partners have the special opportunity to meet up in-person for even more value and fun. The unique strength of the RideAmigos Academy is the opportunity to learn from and share with other transportation professionals who use RideAmigos on a daily basis. Our in-person meet-up gives you the chance to connect with the Academy members you’ve heard from during our monthly webinars and to compare notes with other users. Find out how industry leaders are leveraging the many tools within RideAmigos, and which TDM strategies are proving most effective. Academy members are always at the forefront of RideAmigos product updates and announcements. We’ve got some big news coming up around this year’s ACT conference and the Academy meet-up will be a great opportunity to learn how these new additions will help you create and manage impactful commuter programs. Here at RideAmigos we’re always listening to our customers and watching the evolution of the smart mobility ecosystem to determine how to provide the best products in the business. This year’s Academy event will feature an in-depth exploration and discussion of industry trends, which will ultimately inform future RideAmigos tools and programs. You’ve got to eat, right? Why not do so for free, and have a drink on us while you’re at it! As a way to show our appreciation for you, our beloved Academy members, your food and drinks are provided. Who says there’s no such thing as a free meal? In case you aren’t aware, the most famous party of the year for the commuter management industry also happens on the last night of the ACT conference. 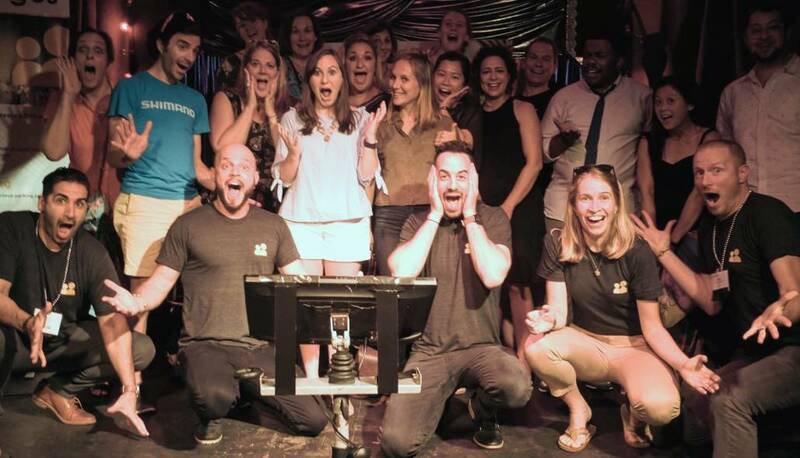 The annual RideAmigos karaoke party is not to be missed, and if you’re at the Academy meet-up you’re already there. Starting at 8pm we’ll transition into party mode, so be ready to belt out some duets with your colleagues and close out the conference right. The karaoke party is free and open to anyone attending the ACT conference. If you’re in the market for better tools and resources for running your commuter programs, you won’t find a more active, engaged, and fun user group than the RideAmigos Academy, and membership is included for all RideAmigos platform and network administrators. Want to learn more? Get started with RideAmigos today. Washington state’s Greater Redmond Transportation Management Association (GRTMA) has been running an annual bike-focused commuter challenge since 2006. The challenge, cleverly called the “Tour de Redmond“, is designed to recognize commuters who regularly bike to work, and to introduce drivers to cycling with the hope of inspiring long-term behavior change. RideAmigos first supported the Tour de Redmond in 2012, when the organizers used our cloud-based platform to manage registration and run the challenge. We can’t think of a better way to start and end a summer workday than biking through beautiful Redmond, Washington. We’re proud to be powering the Tour de Redmond again this year as an official sponsor of the event. RideAmigos facilitated the program’s successful transition to a true gamification-based commuter engagement strategy. Participants can view their rankings on a live leaderboard and instantly compare themselves and their team to other riders. The commuter challenge features make it easy for riders to track their progress toward the program’s prizes, all while engaging their competitive spirits. For program organizers, a commuter management platform makes it easy to generate reports, maps, and visualizations. These features give GRTMA officials useful and actionable insights into commuter behaviors during the challenge, allowing them to make ongoing evaluations about the city’s cycling infrastructure while continuing to find new ways to encourage community members to adopt cycling as a long-term commuting solution. The Tour de Redmond has continued to build on that success. The 2018 challenge just kicked off at the beginning of June and RideAmigos is proud to be a part of it again this year. We’re looking forward to seeing this year’s results! If you’d like to learn more about what our platform and programs can do for you, or if you are looking for advice on jump-starting your own commuter challenges, get started here. Leading by example is an essential aspect of the RideAmigos philosophy. We aren’t just here to talk about smart alternatives to solo driving; we strive to put our values into action. Our team members are active participants in our internal commuter programs, and they’ve shown a remarkable level of commitment. More than half of our employees choose transportation modes other than solo driving most of the time, and one-quarter of our team never travels to work in a single-occupancy vehicle. Embrace of alternative modes by our founders is a big part of the reason we’ve been able to foster such an exceptional company culture around commuting. Today, we’d like to highlight the forward-thinking transportation decisions of our co-founder and director Jeff Chernick, who made the bold move to divest himself of his car altogether. RideAmigos is based in Santa Monica, California, and if you’re familiar with the Los Angeles area, you know that navigating the city without a car is by no means the most common option. Jeff has persevered, and now does most of his local travel by e-bike. His story makes a great case study in the many benefits of embracing alternative modes of transportation. In a recent interview, Jeff shed some light on what initially inspired his decision to get rid of his car. He talked about the daily cost of parking and monthly costs for car payments and insurance. When his car’s lease came up for renewal it was a great time to consider better ways to spend his money and time. After initially extending his lease for six months, Jeff decided to take the initial plunge and go for a car-free lifestyle. “The first step was just to give up the car and start talking Lyft and Uber to work,” Jeff said. “I did the math, and I was spending around $300 a month on my lease, plus gas and insurance. It’s usually around $9 each way for a Lyft or Uber, and now I wouldn’t have to park.” So, round-trip transportation to and from work cost about $18 a day, but Jeff freed himself of $9 to $10 per day in parking costs. “It just made sense,” Jeff continued. He commutes to the office three to four days per week, which averaged about $70 per week in ride-hailing expenses. That added up to about $280 to $300 per month, which was less than the combined cost of his car lease, insurance, and daily parking. So, from the standpoint of commuting to work, ditching his car made sense to Jeff. But what about personal trips? “The bigger trips are definitely harder,” Jeff conceded. “It does add up, but I was already taking Lyft and Uber for some personal trips anyways.” Factoring those trips in, Jeff was basically breaking even switching from his own car to ride-hailing. However, he also discovered an added benefit of his new commuting mode: he was able to be more productive during his trip to work by taking phone calls, catching up on emails, and prepping for the day. “[The bike] goes up to 22 miles per hour, and my new commute is essentially the same amount of time it would take to drive if there’s no traffic.” Jeff’s particular e-bike model retails for about $1,800, and he found that making the change vastly accelerated his cost savings because he’s reliably able to use his e-bike for both commutes and personal trips, given Southern California’s dry and sunny climate. Here at RideAmigos, we know here are lots of people like Jeff who, with a little encouragement and some additional mobility resources, could skip the solo drive and embrace a car-lite or car-free lifestyle. It’s why we’re committed to providing tools and programs for organizations of all types to help them connect commuters, provide transportation options, and reward sustainable choices. If your organization is ready to reduce costs and environmental impact through smarter commuter solutions, let us know – we’re here to help. CommuteCon 2018 was the largest and most successful episode of our annual commuter management and TDM conference to date, with nearly double the registrations and attendees compared to the 2017 event. Professionals from all over the world took part in CommuteCon 2018, and speakers representing a complete range of sectors including enterprise, government, and universities delivered talks filled with meaningful insights and valuable takeaways. We’ve received great feedback about this year’s event from members of our audience. This year’s attendees were particularly enthusiastic about the presentations by keynote speakers Susan Shaheen and Simon Mainwaring. Shaheen, who co-directs UC Berkeley’s Transportation Sustainability Research Center, gave an illuminating talk on the social benefits of shared mobility. Mainwaring, founder and CEO of We First Branding, gave us a peek behind the curtain at some of his most effective strategies for leading conversations that drive social change. We’re incredibly fortunate and thankful that they took the time to join us. Hundreds of TDM professionals and stakeholders came together to join the live webcast, with many attending in groups of two to five people or more. It was a landmark event for the global commuter management community, and we’re beyond pleased that it was such a resounding success. CommuteCon 2018 was presented by RideAmigos. We are grateful to our Sponsors, JUMP and Scoop; Friends of the conference, Car2Go, CityFi, Edenred Commuter Benefit Solutions, Lyft Business, First Transit, TransitScreen, UBER for Business, Waze Carpool, and Zipcar; and our Association Partner, the Association for Commuter Transportation. The CommuteCon team is thrilled to announce that we’ve set the date for next year’s event. CommuteCon 2019 will take place on Wednesday, February 13, 2019 – mark your calendars now! Like previous conferences, CommuteCon 2019 will be an accessible, community-oriented platform for the free exchange of ideas and strategies, all while helping TDM professionals expand their impact and inspiration. Visit commutecon.com to sign up for conference updates. Thanks again to everyone who helped make CommuteCon 2018 such a meaningful and valuable event. We hope see you next year! The RideAmigos team has exciting news: we’re adding new platform integrations with Edenred Commuter Benefit Solutions, and we couldn’t be more excited about the ways this will benefit our partners. Edenred Commuter Benefit Solutions is the nation’s only comprehensive commuter benefit solutions provider and number one resource for commuter savings. Since 1985,Edenred has served Fortune 100 and Fortune 500 companies, top third party benefit administrators and the nation’s largest metropolitan area transit authorities. With its premier solution offerings; Commuter Check, a nationwide commuter benefits program for employers; and WiredCommute, a private label program for third party administrators, Edenred is able to provide a one-stop total solution experience.Edenred’s mission is to make tax-free commuter benefits a staple in employee benefits packages nationwide. employees, including many Fortune 500 and Fortune 100 companies. Edenred Commuter Benefit Solutions has a strong core focus on managing and delivering both employer and employee-based commuter pre-tax benefits programs. These programs help enterprises generate savings of up to 7.65% per year on their payroll taxes while helping employees generate huge savings on their taxable incomes. They provide extensive support, including dedicated account managers, nationwide coverage, convenient product delivery, and a complete suite of support services. RideAmigos is proud to be creating connections between Edenred Commuter Benefit Solutions products and our industry-leading commuter management software. Our partnership will give the businesses and organizations that use our platform easy access to one of the world’s most powerful commuter benefit management programs. The goal is to make generating, tracking, and maximizing both employer- and employee-based tax savings as convenient and profitable as possible. To learn more, check out the recent Coffee Talk webinar we held with Commuter Benefit Solutions to discuss their product and our plans, or contact us directly.